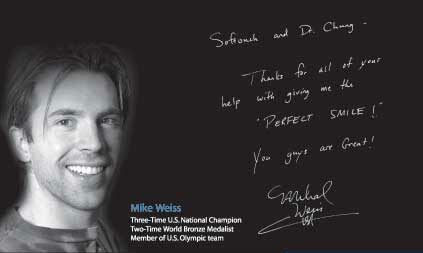 Letter from Michael Weiss, Two-Time World Bronze Medalist. Letter from Bob Denson, President & CEO of DTech Labs, Inc.
"I never had a reason to smile before, until I met Dr. Chung. Dr. Chung has enriched my life and provided meaning in ways I could only dream about. I have never met anyone in dentistry that is so friendly and caring like Dr. Chung and his team. They were never in a hurry to slap on a perfect smile, they wanted to make sure that my mouth was healthy so I could enjoy my new smile for a lifetime. The level of perfection and personal touch that Dr. Chung contributes is immeasurable! Dr. Chung has given me my life back and for that I am extremely grateful. Dr. Chung is truly my hero because he gave me my self confidence back through a healthy and beautiful smile! It just makes you fearless...you can conquer anything with a Dr. Chung smile! THANK YOU DR. CHUNG!" "I had less than a year to get a perfect smile for my wedding. I looked into invisalign and braces, but knew that my teeth wouldn't be picture perfect in such a short time. Luckily, I came across Dr. Chung's magazine; I thought 'Since Michael Weiss went to Softouch Dental Care and the smiles in the booklet are beautiful I should try it out too.' I went in for a consultation and the rest is history! I can't stop smiling and what's even better is that my teeth and gums are healthy now!" "I have always been the type of person that has shielded her smile whether it was in pictures or in regular conversation, all because I was really uncomfortable with how my teeth looked. 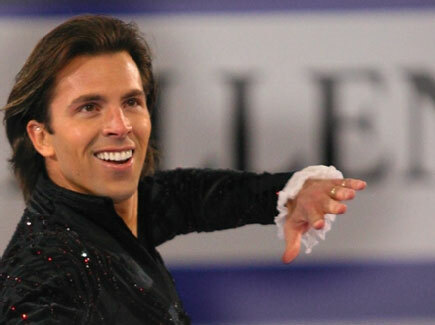 In fact, I hated pictures of myself because of how bad my smile looked. My teeth were uneven, slightly crooked and were starting to yellow with age. The moment Dr. Chung completed my veneers, I couldn't stop myself from smiling and haven't stopped smiling since! It's as if someone gave me a new outlook on life ... all because I can smile with so much confidence now. It is extremely freeing!"